More than 2,300 years ago Aristotle famously wrote that we are more than the sum of our parts. This nugget of wisdom still resonates today, for at least one simple reason: connections. In the past two decades technology has transformed our understanding of what it means to be truly connected. Easy access to centuries of knowledge, and to like-minded thinkers worldwide, allows new ideas to coalesce at a startling speed. 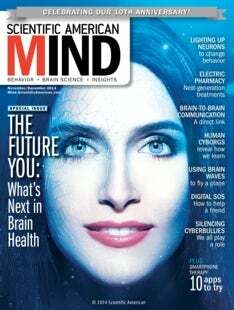 In this special issue of Scientific American Mind, we take stock of key advances that are altering the way we think about connectivity and the human brain. Through technology, inventions that until recently were considered pure fantasy—a direct link between brains, machines that can reconstruct dreams, tiny solar panels embedded in neurons—are now facts of life. Welcome to the future. At a cellular level, technology is revealing how a person's neurons update themselves to generate a living library of experience. This plasticity—fodder for the marketing campaigns of countless self-help guides—makes us adaptive, creative and intelligent. Yet its mechanisms have long bedeviled scientists. In the first part of the report, “The Neural Code,” we explore how emerging techniques are letting us hack the brain, to lay bare its secrets and extend our influence past the boundaries of flesh and bone. A single brain is a computing marvel, but it pales in comparison to the powers of the networked mind. Social ties also permit us to surpass limitations, whether it be through an act as humble as asking a friend for advice or as ambitious as banding together to build a better smartphone. Tapping into human connections has never been easier, and in our report's second section, “The Social Web,” we examine how interpersonal relationships manifest online. Love and hate persist—but with a digital twist. To make the most of our networked noggins, we still need to address a critical issue: the toll of mental illness, a leading cause of disability worldwide. Here, too, our collective brain trust may at last be making headway. The final chapter, “The Healing Touch,” explores advances in modifying the brain, both to tweak problematic circuitry and to answer urgent questions about what causes dysfunction. The approaches described in this section are helping psychiatry become tech-savvy.